Sakineh Mohammadi Ashtiani was convicted of adultery in 2006 and was originally sentenced to death by stoning. Tehran, Iran (CNN) -- An Iranian court has delayed the final verdict of a 43-year-old woman sentenced to death by stoning, a human rights group said Sunday, two days after the country announced she will not be executed during the Muslim holy month of Ramadan. The International Committee Against Stoning did not say how it got its information on the postponement of Sakineh Mohammadi Ashtiani's final verdict, which had previously been scheduled to come down last Thursday. The group said in a statement that the final verdict in Ashtiani's case is now expected on August 21, the date of her lawyer's next court appearance. Iranian state TV broadcast a program about Ashtiani on Friday in which it said that she will not be executed during Ramadan, which began last week, the International Committee Against Stoning said Sunday. The mother of two faces a death sentence for adultery. Last month, Iran's top human rights official said the Islamic regime is reviewing her sentence. 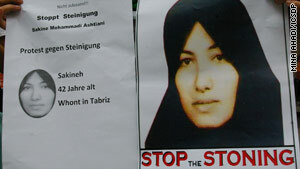 The International Committee against Stoning said Sunday that it and Ashtiani's family are "extremely concerned" about her fate. The group said that Iran has executed 73 people in recent days, including some on Friday. In an interview with Iranian state-run TV last week, Ashtiani denounced her lawyer and said she knew about a plot to kill her husband, but human rights groups alleged that the statements were coerced. "Televised 'confessions' have repeatedly been used by the authorities to incriminate individuals in custody," Amnesty International said Thursday, a day after Ashtiani's interview ran on state-run TV. "Many have later retracted these 'confessions,' stating that they were coerced to make them, sometimes under torture or other ill-treatment. One of the condemned woman's lawyers, Mohammad Mostafaei, said his client made those comments "to save her life" and noted that the death sentence for murder charges related to her husband's death had been commuted. Brazil has offered to give asylum to Ashtiani but Iran has rejected the proposal. In an interview with the state-owned Agencia Brasil news outlet, however, Iranian Ambassador Mohsen Shaterzadeh said Brazil had not made a formal offer to the Iranian government for asylum. But Agencia Brasil said Brazil's foreign minister, Celso Amorim, had reiterated on Wednesday the government's offer to have Ashtiani sent to the South American nation. "I think there is no need to create some trouble for President Lula (Luiz Inacio Lula da Silva) and to take her to Brazil," Iranian President Mahmoud Ahmadinejad told the country's state-run Press TV in an interview. "We are keen to export our technology to Brazil rather than such people." Ahmadinejad said he had spoken with the head of the judiciary "and the judiciary does not also agree with such a thing."